The worst habit is losing track of what really matters to you. Nothing sabotages your productivity quite like bad habits. They are insidious, creeping up on you slowly until you do not even notice the damage they are causing. Bad habits slow you down, decrease your accuracy, make you less creative and stifle your performance. Taking control of your bad habits is critical, and not only for productivity’s sake. A University of Minnesota study found that people who exercise a high degree of self-control tend to be much happier than those who don’t, both in the moment and in the long run. It takes you 15 consecutive minutes of focus before you can fully engage in a task. Once you do, you fall into a euphoric state of increased productivity called flow. Research shows that people in a flow state are five times more productive than they otherwise would be. When you click out of your work because you get an itch to check the news, Facebook, a sport’s score, or what have you, this pulls you out of flow. This means you have to go through another 15 minutes of continuous focus to reenter the flow state. Click in and out of your work enough times, and you can go through an entire day without experiencing flow. Meetings gobble up your precious time like no other. Ultra-productive people avoid meetings as much as humanly possible. They know that a meeting will drag on forever if they let it, so when they must have a meeting they inform everyone at the onset that they will stick to the intended schedule. This sets a clear limit that motivates everyone to be more focused and efficient. Productive people do not allow their e-mail to be a constant interruption. In addition to checking their e-mail on a schedule, they take advantage of features that prioritize messages by sender. They set alerts for their most important vendors and their best customers, and they save the rest until they reach a stopping point in their work. Some people even set up an autoresponder that lets senders know when they will be checking their e-mail again. When you sleep, your brain moves through an elaborate series of cycles, the last of which prepares you to be alert at your wake up time. This is why you will sometimes wake up right before your alarm clock goes off—your brain knows it is time to wake up and it is ready to do so. When you hit the snooze button and fall back asleep, you lose this alertness and wake up later, tired and groggy. Worst of all, this grogginess can take hours to wear off. So no matter how tired you think you are when your alarm clock goes off, force yourself out of bed if you want to have a productive morning. Multitasking is a real productivity killer. 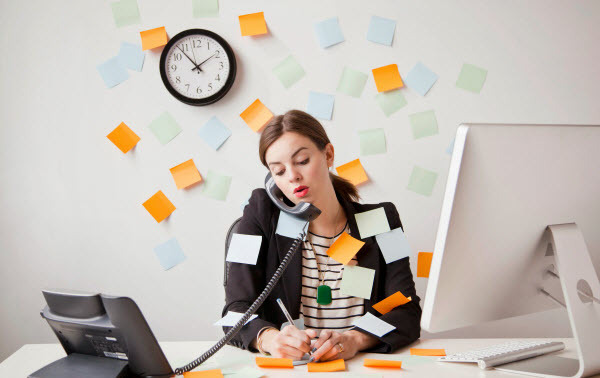 Research conducted at Stanford University confirms that multitasking is less productive than doing a single thing at a time. The researchers found that people who are regularly bombarded with several streams of electronic information cannot pay attention, recall information or switch from one job to another as well as those who complete one task at a time. When you try to do two things at once, your brain lacks the capacity to perform both tasks successfully. We have a limited amount of mental energy, and as we exhaust this energy, our decision-making and productivity decline rapidly. This is called decision fatigue. When you put off tough tasks till late in the day because they are intimidating, you save them for when you are at your worst. To beat decision fatigue, you must tackle complex tasks in the morning when your mind is fresh. This is a big one that most people do not even realize harms their sleep and productivity. Short-wavelength blue light plays an important role in your mood, energy level and sleep quality. In the morning, sunlight contains high concentrations of this blue light. When your eyes are exposed to it directly, the blue light halts production of the sleep-inducing hormone melatonin and makes you feel more alert. In the afternoon, the sun's rays lose their blue light, which allows your body to produce melatonin and start making you sleepy. By the evening, your brain does not expect any blue light exposure and is very sensitive to it. Most of our favorite evening devices—laptops, tablets, televisions, and mobile phones—emit short-wavelength blue light, and in the case of your laptop, tablet and phone, they do so brightly and right in your face. This exposure impairs melatonin production and interferes with your ability to fall asleep as well as with the quality of your sleep once you do nod off. As we have all experienced, a poor night’s sleep has disastrous effects upon productivity. The best thing you can do is to avoid these devices after dinner (television is OK for most people as long as they sit far enough away from the set). Glucose functions as the “gas pedal” for energy in the brain. You need glucose to concentrate on challenging tasks. With too little glucose, you feel tired, unfocused and slow; too much glucose leaves you jittery and unable to concentrate. Research has shown that the sweet spot is about 25 grams of glucose. The tricky thing is that you can get these 25 grams of glucose any way you want, and you’ll feel the same—at least initially. The difference lies in how long the productivity lasts. Donuts, soda and other forms of refined sugar lead to an energy boost that lasts a mere 20 minutes, while oatmeal, brown rice and other foods containing complex carbohydrates release their energy slowly, which enables you to sustain your focus.